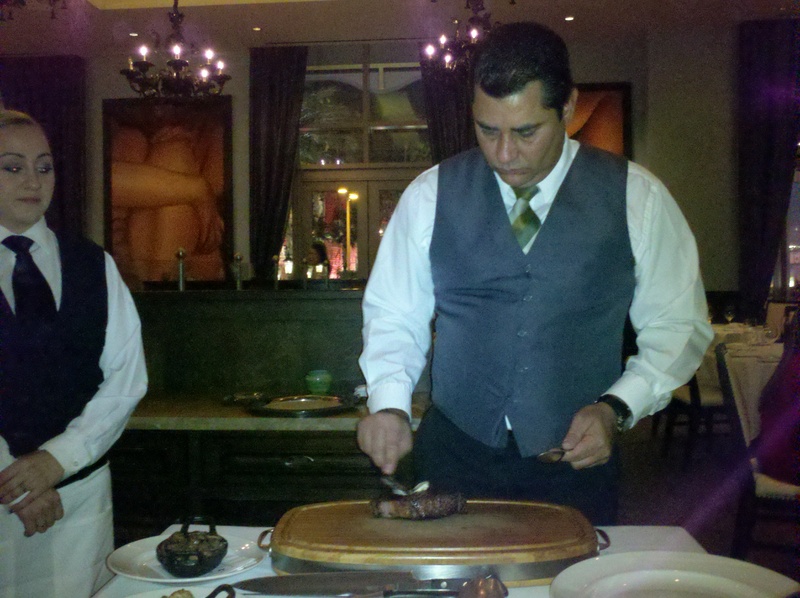 I rarely feel compelled to promote corporate brands, but I recently enjoyed tastings at two restaurants in Las Vegas, both of which happen to be somewhat “under the radar;” happen to offer price points slightly below their quality might call for; and happen to be operated by the Los Angeles-based MCC Hospitality Group. It can’t be a coincidence. 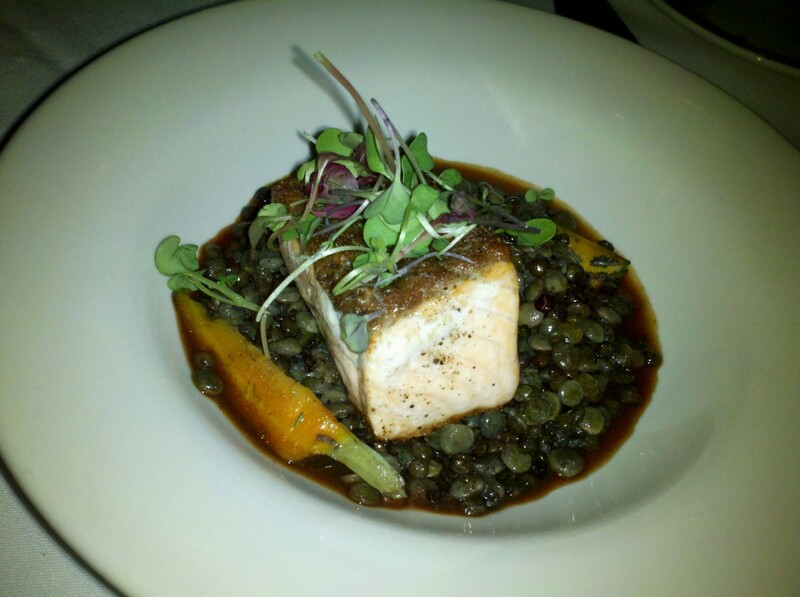 Off the hotel lobby in a Strip-side corner, Morel’s bistro has tended to be overlooked for the Palazzo’s more splashy Celeb-chef eateries (CUT, Table 10, Dos Caminos), clubby Lavo and funky SushiSamba…among other worthy options. The fact that it has such an understated entrance (in contrast to an inviting interior) probably doesn’t help. I’ve frequently praised them in the past, but mainly for their unique cheese program (over 60 selections available—possibly the biggest and best in any US restaurant) and strong enomatic/by-the-glass wine program (also around sixty offerings and growing). With Alexandre Brard (ex-Joel Robuchon) now overseeing beverages, expect this department to improve even more, emphasizing worldwide discoveries and values over the showy labels you might expect from a French-trained sommelier. There are no illusions here that your experience will be like mine—Brard insisted on pairing every single dish I sampled, even each of three cheeses, for example. 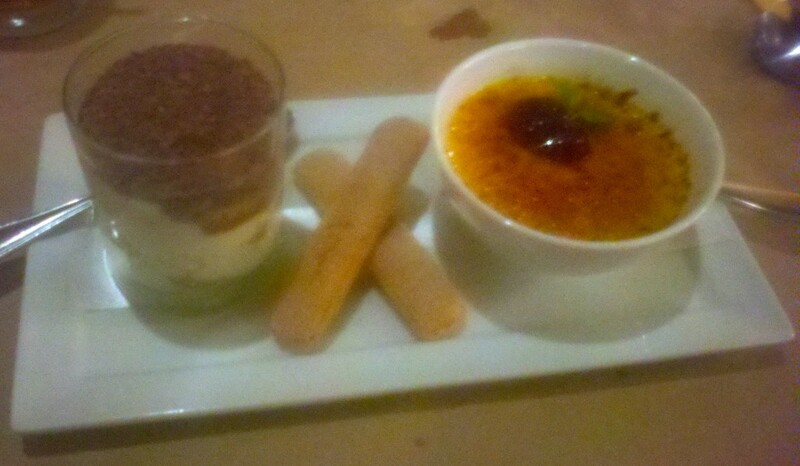 Still it’s worth sharing not just for bragging rights, but also to emphasize that not a single dish I tried was off key. Which means you’re unlikely to have a mediocre experience here. 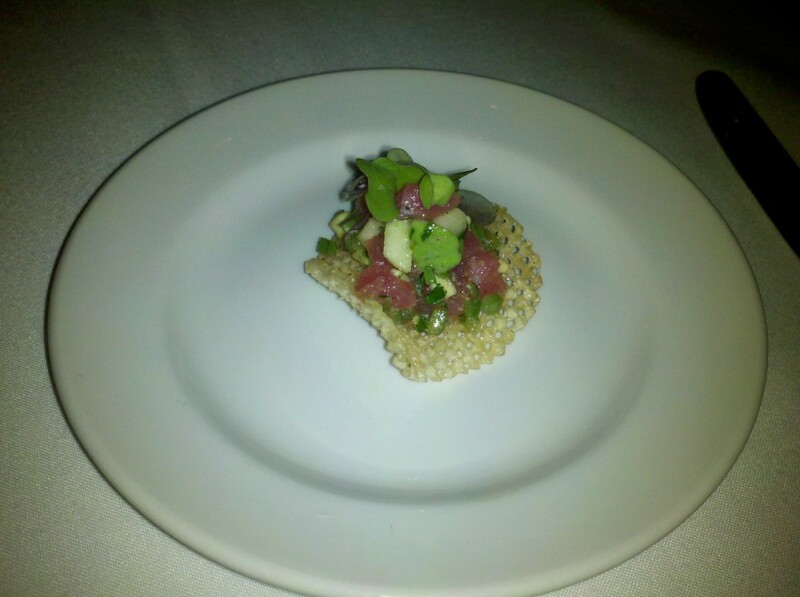 We started with an amuse of tuna tartare atop a delicate potato gaufrette (the world’s fanciest chip, basically), nicely balanced in textures and flavors, paired with a delicate cava. Then we had a course of three classic cheeses—aged hook cheddar, stilton, and triple cream, paired respectively with Sanctuary cab 08, Warre’s 10 yr old Tawny Port Optima, and fortified Pommeau de Normandie (of which Brard was most proud). 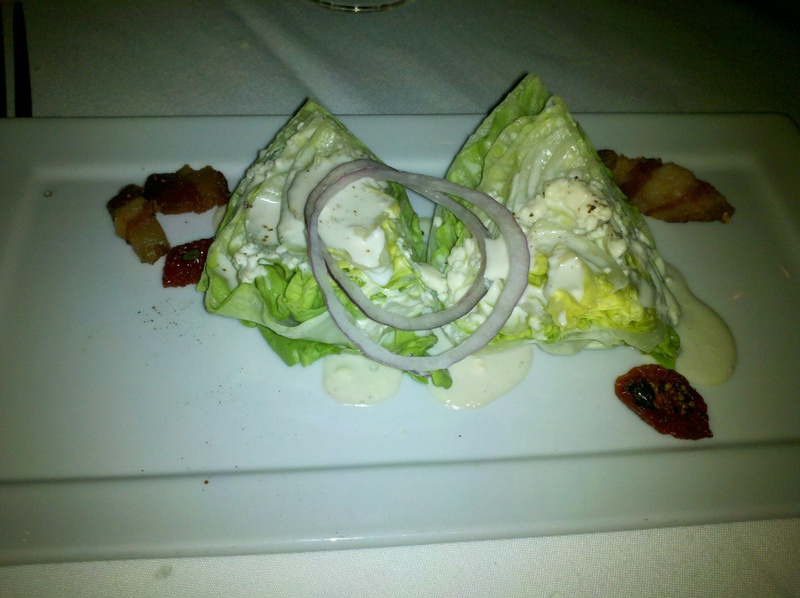 A pleasantly simple salad of small iceberg wedges with blue cheese and lardons followed. 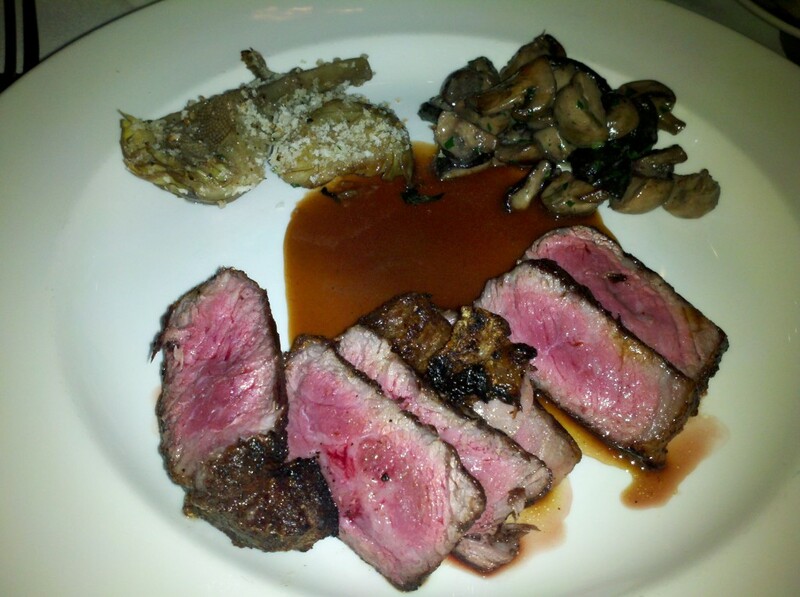 The meat course was dry aged rib eye, sliced tableside and served with bordelaise sauce, mushrooms and sautéed artichoke. It was perfectly cooked, crusty, chewy and juicy inside. I hate to tell you how rare it is that beef is served so correctly—and if you go here and get some and it isn’t done as well, please send it back. I insist. Oh, Brard poured us a nice soft tempranillo/cab with it. 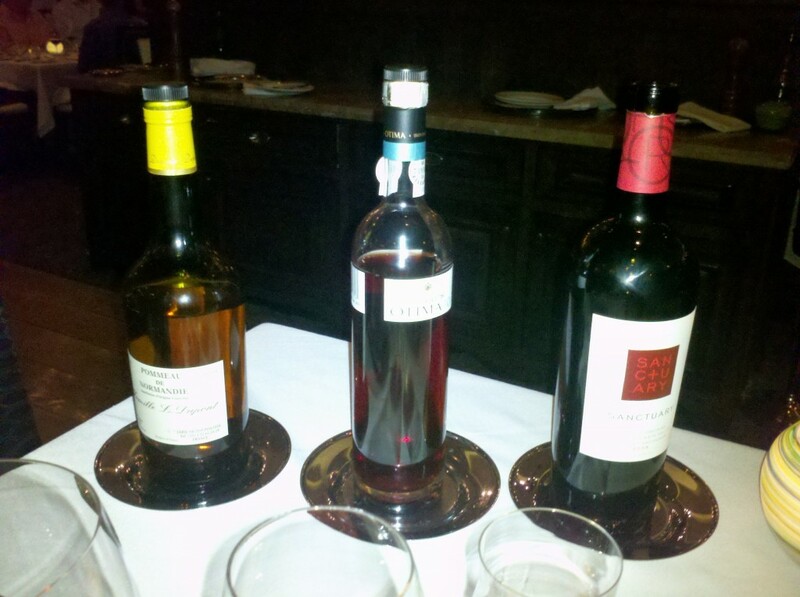 Note that barely any French wine was poured, and yet every pairing was interesting and successful. 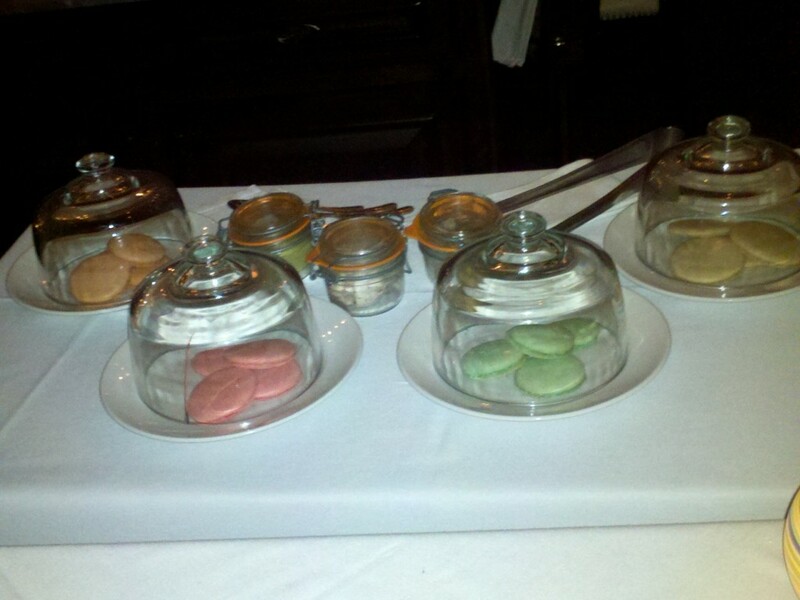 For the sweet, the waiter brought a presentation of daily housemade macarons, which he filled with different flavored jams: coffee, pistachio, raspberry, pumpkin. I’m not a macaron fan, but it was a fun finish. A couple weeks earlier, Exec Chef Jose Navarro at Morel’s sister property d.vino in the Monte Carlo also did a (slightly less formal) tasting for me. Like Morel’s, d.vino isn’t slavishly traditional cuisine, but it isn’t obnoxiously dumbed down. In the past 18 months or so, all of the Monte Carlo’s food venues have been revamped, and d.vino is no exception. Like many casino Italian restaurants, the space is separated into a more casual front area and a slightly more formal rear room. In the front you’ll find wines by the glass in an Enomatic machine, as well as a raw bar that’s one of the few on the Strip (and I believe, fractionally cheaper than others like Comme Ça, Bouchon, RM Seafood, PJ Clarkes). The rear dining room is far more pleasant for a meal, however, and hardly stuffy. 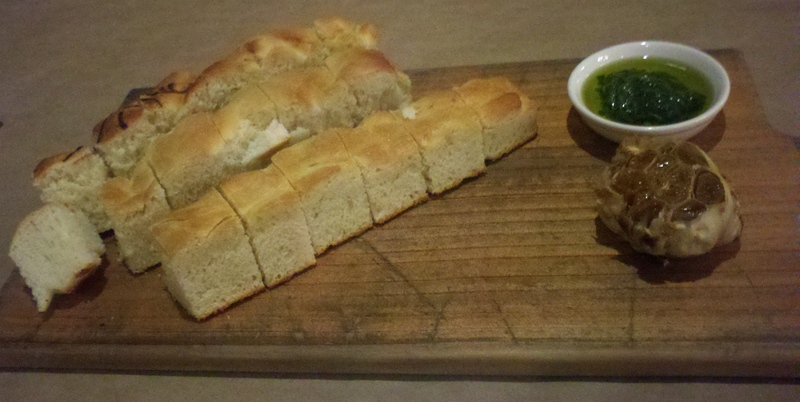 I’m tempted to digress about how small touches like bread service can make all the difference in setting the tone of a meal, but I’ll spare you and just point out that the first thing on the table was a wood block with cubed fresh foccacia (three kinds), fresh basil in evoo, and a roasted head of garlic. Simple, but very classy. 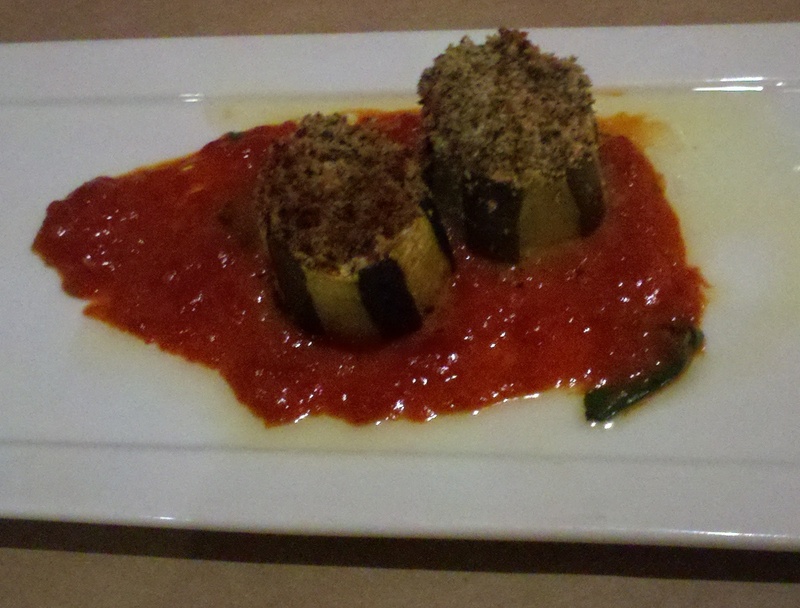 Chef Navarro started me off with what might have been my favorite of his dishes (not to be anti-climactic): a stuffed zucchini antipasti (the normal portion is bigger than pictured here) that fills thick rings of Italian squash with bright, fresh tomato sauce, mozzerella, and a heap of herbed breadcrumb. So simple but so good. 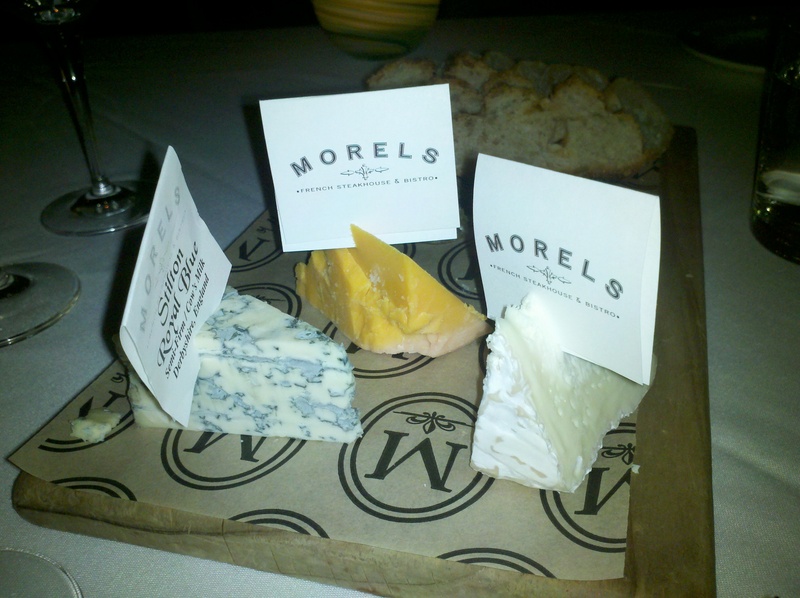 Their relationship with Morel’s means that d.vino too can serve a selection of cheeses—mostly Italian and Spanish, all European—that is abbreviated from Morel’s menu, but at 14 choices is still far more than you see most places. And $21 for seven selections means you could just order that and a couple glasses of wine and have an elegant snack. I sampled Italian Grana Padano, French Valençay Pyramide, and Belgian Chimay Grand Cru along with some San Daniele proscuitto, La Quercia ham and a little Salame Toscano. 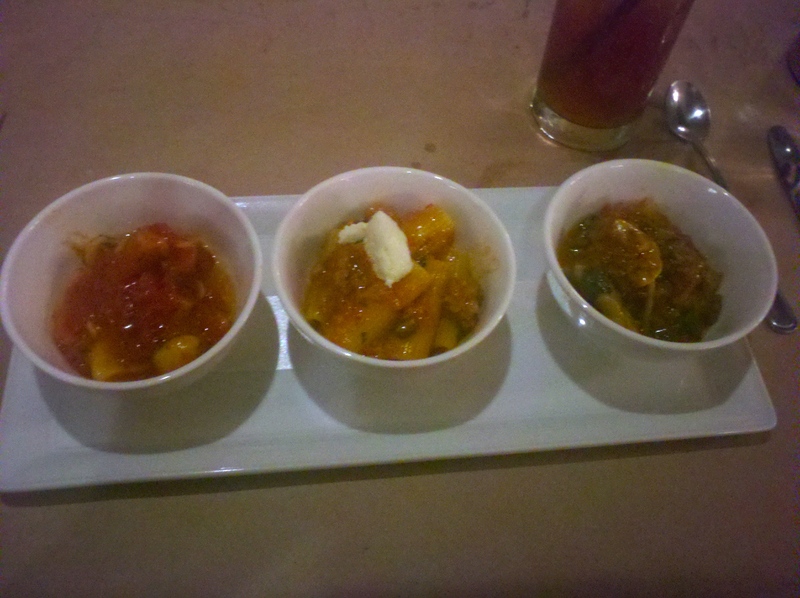 Of the solid pasta and risotto selections (including a vegetable risotto), I tried some buttery soft gnocchi in a simple bright tomato sauce; a rigatoni with Italian sausage ragout, roasted peppers and onions, with the hearty sausage spices dominating; and soft, savory mushroom ravioli in Bolognese sauce. These pastas measure up to some of the best I’ve had in Las Vegas. For mains, Jose offered a taste of his osso bucco, made from slow cooked Amish veal, properly tender but toothy, and rich with flavor over simple saffron risotto. 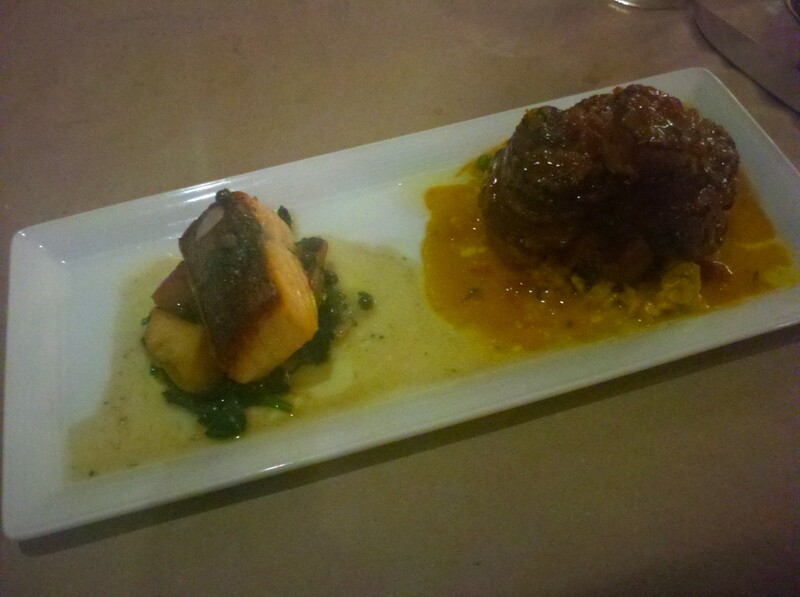 I also sampled a nice Scottish salmon, creamy and mild beneath flavorful crispy skin, in caper butter with garlic spinach and potato–close to the one at Morel’s, though not quite as elegantly accompanied. Desserts were a tiramisu mousse and crème brulee with raspberry glaze. Morel’s and d.vino may not get lots of attention relative to other Strip restaurants, but they both deliver solidly at reasonable prices, and when you’re on vacation, there’s a lot to be said for that.